The pin-in-paste (PIP) process is often the best choice when the PCBA is a mixed SMT and through-hole board with a small number of through-hole components. However, assuring that the correct volume of solder paste is printed to ensure an adequate amount of solder for a reliable thorough-hole solder joint can be a challenge. One tool to help in this regard, is the Pin-in-Paste Aperture Calculator. This calculator is now online at http://software.indium.com/. The solder volume equations were developed by Indium Corporation's good friend Jim McLenaghan of Creyr Innovation. 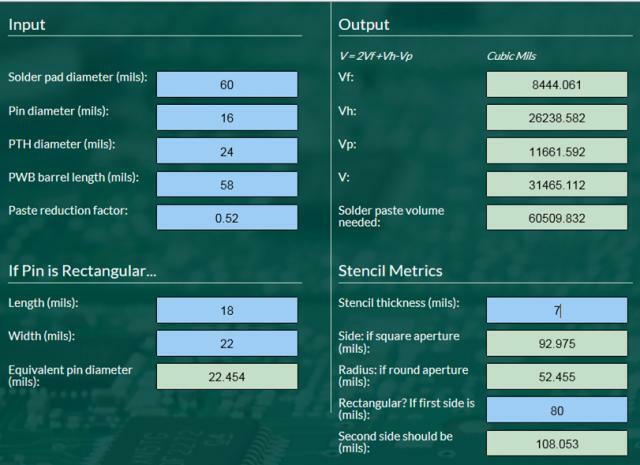 To estimate the right amount of solder paste, we need to calculate the volume of the plated though hole, subtract the volume of the component pin, and add the volume of the solder fillet. See Figure 1. Figure 1. Solder volumes in the Pin-in-Paste process. Let’s assume we have the PCB and component pin metrics, as seen in the left hand column of Figure 2, under the header “Input.” Blue cells are inputs, green cells are calculations by StencilCoachTM. Notice that, if you have a rectangular pin, StencilCoachTM will calculate the equivalent pin diameter for entry into the “Input” cells. The “paste reduction factor” is the fraction of the paste volume that is solder. Most pastes are about 50% by volume flux, so, typically, this metric would be about 50% or 0.50. The “Output” calculations are not really necessary for the task at hand, which is determining the stencil aperture dimensions, but may be of interest. The important stencil dimensions are shown in the “Stencil Metrics” section. Note that in our example, even though we have a 7-mil thick stencil, we would need a square aperture with a side dimension of 93-mils to get enough solder paste. With a circular aperture the radius must be >50-mils, if the pin spacings were 100-mils, there would not be enough spacing between the printed deposits, they would overlap. So we must use square apertures. As in this case, it is a common problem with the PIP process to deliver adequate solder volume. If the PCB and component metrics are such that obtaining enough solder paste is an issue, it can be helpful to use solder preforms to increase the solder volume. The next post will cover this topic.